Having recently experienced an earthquake and a hurricane here in DC in less than a week, I thought I had seen my quota of disasters for a while. That is until this book showed up. In the pantheon of JFK literature we usually get one goofball theory per book. 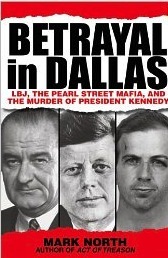 But in Betrayal in Dallas: LBJ, the Pearl Street Mafia, and the Murder of President Kennedy, author Mark North doubles-down and we get two discredited theories for the price of one. In this alternative universe LBJ, in cahoots with something called the “Pearl Street Mafia” (an invented title as the author admits), had JFK bumped off. For good measure, LBJ’s old crony and FBI head, J. Edgar Hoover is thrown into this mix as well. Hoover seems to be a favorite boogey man of North’s as he strongly implied JEH involvement in the President’s assassination in his previous offering, Act of Treason. In Betrayal in Dallas, according to North, Hoover’s complicity is unequivocal. It’s a common maxim that extraordinary claims demand extraordinary evidence. Yet the only extraordinary thing here is the marketing hype plus the author’s own undocumented claims. For instance, on page xi the author makes the bold assertion that “the new evidence revealed in this book proves to a legal certainty everything you have just read” [my emphasis].Talk about empty bombast. In the 159 skimpy pages that make up the body of the book, the case is not even close to being made. In a hyperbolic statement on the publisher’s website we are breathlessly told, “North’s conclusions are based on classified federal documents unknown to the public and research community.” And finally the author makes this bold declaration: “The evidence contained in this volume will force the hand of that [Justice] department by making public what they will not.” I may have missed it, but I don’t recall Eric Holder’s press conference confirming North’s assertions. Since we are told that the book is based on “documents unknown to the public and research community” certainly a check of the endnote section is a priority. By the way, I love how JFK researchers are slammed as being too thick to have discovered North’s “evidence”. Well, if that evidence consists of back issues of newspapers then, yes, I guess we have all missed the boat. You see, while some have us have wasted our time combing through the millions of pages of JFK related documents released by the Assassination Records and Review Board, North has trumped us all by simply reading loads of old newspapers. When one turns to the endnote section, one is immediately struck by a bizarre sourcing technique in which multiple instances of newspaper articles are presented in one endnote. For instance, endnote 10 of chapter 3 has close to 200 Dallas Morning News articles cited in that one endnote alone, and it runs on for 2 pages! One might get a pass on this if this was just an anomaly, but every chapter gets this kind of treatment with multiple source notes citing multiple instances of newspaper clippings. Has anyone ever seen such a format used before? On estimate it looks like 90 % of his endnotes are newspaper clippings. This goofiness makes up about 30 pages of the book while meaningless “exhibits” (mostly mundane letters) and other back matter account for another 80 plus pages. Oh, and don’t go looking for an index either. If you can believe it, there isn’t one. I’m on record as stating that the amount of pages shouldn’t be a consideration as long as you have something to report. But what North has done here gives the word ‘extraneous’ a whole new meaning. The United States government took four years to declassify millions of pages of formerly declassified or severely redacted documents on the murder of President Kennedy. Some of these papers were exceedingly interesting. Some of them were more than that. Some of them were absolute gems. To forsake that vital resource for old newspapers, to not utilize the documents at one’s disposal in the wake of the ARRB’s work, this is just shoddy. It kind of says: There wasn’t anything in those documents of value to my thesis. So let’s forget about them and read some reams of old newspapers instead. And speaking of shoddy, I think this is the first instance that I can recall where the publisher couldn’t get their own author’s name right. On the back cover blurb of Betrayal, they print “praise for the bestseller Act of Treason by Mark Lane.” That’s right. Mark LANE. The reader will recall that the author is in fact Mark North. The slapdash approach continues on the inside where, along with the examples previously mentioned, the author writes that RFK was a Senator on the McClellan Committee in the 1950’s. Of course, Robert Kennedy was not elected Senator until 1964. I’ve not mentioned North’s take on the hybrid conspiracy to kill the President as it hardly merits mentioning. But basically it’s the usual suspects: the Civello/Marcello arm of the Mafia killed JFK, this time with LBJ’s complicity. Johnson was also “mobbed up” along with other notable politicians, lawyers and judges (i.e. J. Edgar Hoover, Federal Judge Sarah T. Hughes, Assistant Attorney General Barefoot Sanders, and even Lady Bird!). While there is undoubtedly evidence of corruption among some of the politicos North implicates, it takes a giant leap of logic to put them in a criminal nexus intent on murdering the President. Despite the 30 pages of source (newspaper) notes, when it comes time for North to make his bold accusations, there are no citations. For example, on page 39 North writes, “With Civello providing the kill zone, it fell to Carlos Marcello in New Orleans to obtain the assassins.” Similarly on page 42 we are told, “By midsummer 1962, Marcello and Civello had set in motion the plan to murder the President.” Neither of these critical passages have any citations. Not even North’s beloved newspapers. On an affirmative note, North does not fall into the old trap that other “mob did it” enthusiasts do. That is he does not try to smear Jim Garrison as a Mafia goon. On the contrary, on page 33 North correctly notes that “In August , New Orleans district attorney Jim Garrison’s office launched a drive on the Marcello-controlled French Quarter.” North goes on to note that “narcotics trafficking was to be Garrison’s office’s prime target.” Unfortunately, for the entire book, that’s about all you can put on the positive side of the ledger. After reading this volume, the only apparent betrayal will be to the consumer who plunks down $25.00 for this mess. As I mentioned in the above review, for researchers to not utilize the documentation released over the years through the actions of the Assassination Records Review Board (ARRB) is inexcusable. This is a sentiment that I know is shared by this website’s owner, James DiEugenio, as he has mentioned it as well on several occasions, both on this site and on Black Op Radio. Consider the wealth of material the ARRB was able to extricate: the so-called “Lopez Report” on Mexico City, not to mention the supporting documentation, the CIA segregated collection of the House Select Committee on Assassinations (HSCA), the working (and personal) papers of Jim Garrison, Clay Shaw’s papers as well as the Shaw trial transcript, new interviews of all 3 of JFK’s pathologists as well as much new previously withheld medical evidence, CIA Inspector General reports on the Castro assassination plots and the Bay of Pigs, military and CIA documents on Vietnam, not to mention the working papers of the ARRB themselves. And this is just the tip of the iceberg! Interviews (Admittedly getting harder with the passage of time and key people dying off). Secondary sources: books, magazines, newspapers, etc. (But they better be damned good ones by credible authors and used sparingly). But regarding number 2 above, the National Archives (NARA) couldn’t make it any easier for researchers: just email them what you want and they’ll copy it and mail it to you (for a fee of course). There is plenty out there that hasn’t seen the light of day because nobody is doing the leg work. Let me give a recent and brief example. One weekday I went to NARA, arriving at 10:00 AM. I had them pull the working papers of several ARRB staffers. I reviewed several boxes of materials and copied over 100 pages. I was out of there by 1:00 and came away with a wealth of new information, including a heretofore unknown relationship between New Orleans FBI SAC, Warren deBrueys, and CIA spook David Atlee Phillips. The rest of the information will be included in my new book tentatively scheduled for publication in 2013. As with my earlier effort, this was all done on my own dime. For authors getting book contracts and advances, there is simply no excuse for bypassing this resource. Personally I always thought the old evidence was always pretty good. But at this point it makes little sense to regurgitate the efforts of Harold Weisberg, Vince Salandria, Sylvia Meagher and so many others, Especially when there is an avalanche of material waiting to complement their work.